Between my husband, myself and my family, we celebrate pretty much every major holiday. This means lots of traditions shared and a great deal of feasting! Easter and Passover are just around the corner but this week I hosted a small gathering in honour of the Jewish holiday, Purim. Acknowledging Purim entails listening to the story of the holiday, giving to charity, sending gifts of food and having a big feast that usually includes Hamantaschen (triangular shaped cookies filled with one of many fillings). Some even dress up in costume, traditionally as the heroes of the Purim story. Stories, helping others in need, baking for friends, eating cookies, AND an excuse to top my pajamas off with a Queen Esther crown? This is my kind of holiday! 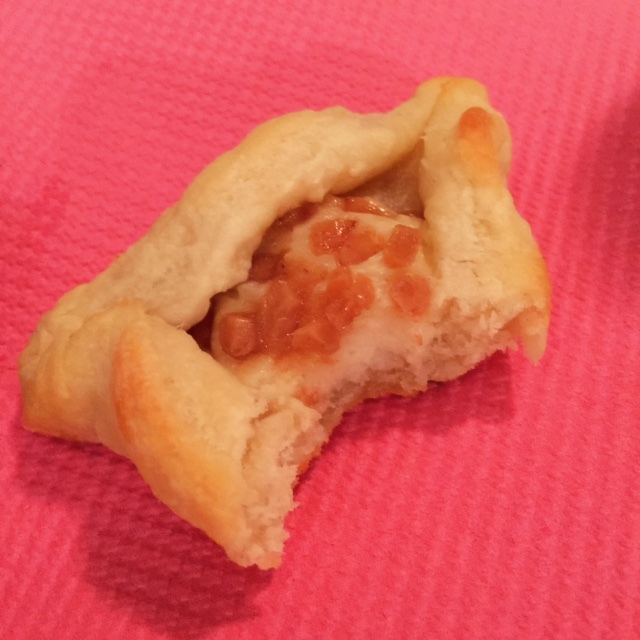 This was my first attempt ever at making Hamantaschen from scratch and was a delectable failure! All of the elements were spot on but the triangular cookies I carefully placed in the oven opened up during baking. Sad face. 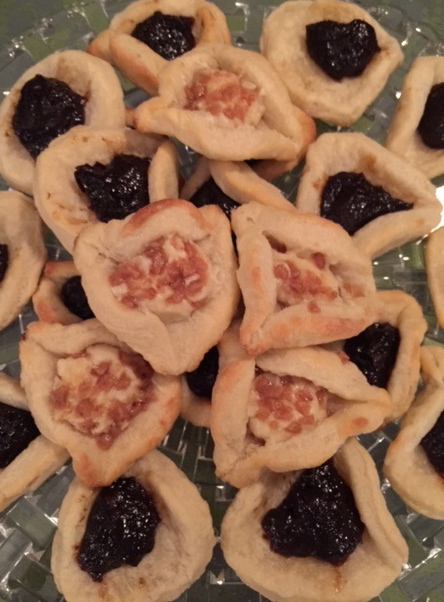 They ended up looking somewhat like confused thumbprint jam cookies but tasted like Hamantaschen heaven. No lie. Yum! The moral of this baking story? Don’t worry too much about messing up or making mistakes. Have fun, use yummy ingredients and you might end up with a perfect dessert or a perfectly delicious mess! Here is the simple recipe I like to use for Hamantaschen dough, it is not overly sweet and balances perfectly with whatever decadent filling you choose. I used a simple and traditional prune filling for some and a new-school toffee cheesecake filling for others (recipe down below). Beat the butter and cream cheese together until light and creamy. Slowly add the flour and sugar until fully combined. 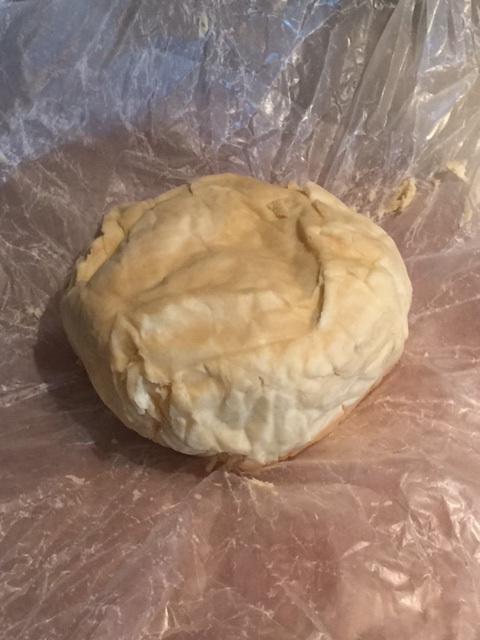 Finally, form the dough into a ball, wrap tightly and chill overnight. Let the dough ball rest at room temperature for 30 minutes and then roll it out to approximately 1/4″ thickness. Using a 3″ round cutter, or in my case the top of a drinking glass, cut out circles. As is the case with any rolled cookie, remove the surrounding scraps of dough to be re-rolled for more cookies. Place a small dollop of filling in the centre of each cut circle. Next, fold one edge of the circle inward to begin making a triangle. As you fold each third pinch the corners together with a drop of water to ensure a tight seal. This may be where I seriously dropped the ball! Bake them at 400 F for 12-15 minutes, until they start to look slightly golden. In any case, I served them up with a sense of humour and a pot of coffee and they were ALL gobbled up by the end of the night. Turns out looks aren’t everything! The cream cheese filling was an experiment and a total hit. It can be piped into cupcakes, stuffed into cookies or scooped up on a graham cracker. It’s like cheesecake’s answer to Nutella. Beat the cream cheese, sugar and vanilla together until the mixture looks well combined and irresistibly smooth. Stir in as many toffee bits as you like. The history of the cookie is full of happy accidents. The cookie itself was an accidental discovery. It is said that bakers would use small amounts of cake batter to test oven temperature resulting in sweet little treats, the predecessors of what we lovingly recognize as cookies today. The very first chocolate chip cookie was also invented by pure happenstance many years ago. A woman named Ruth Wakefield was baking cookies for guests staying at her Inn. She had run out of baking chocolate to make chocolate cookies. Out of sheer resourcefulness and necessity she broke up pieces of a Nestle semi-sweet chocolate bar, expecting it to melt into the dough. This fateful substitution created the very first chocolate chip cookie. It was ultimately named after the Inn where it’s birth took place, giving us our all-time favorite, deeply cherished Toll House Cookie! I’m totally inspired by the cookie’s delightful history. I love the idea that tiny mistakes, simple substitutions and going with the flow when your plan gets thrown off course can lead to such wonderful creations. I had my plan thrown off course last year when I took off on vacation and left all of my pajamas at home! I plan and covet my sleepwear with the intensity that some reserve for… well I don’t know, but not pajamas. Anyways, I was not happy! Out of desperation I snagged a white cotton tee shirt to sleep in from my husband’s suitcase, and I have since become hashtag obsessed with. I know I am far from the first person to sleep in a men’s tee shirt, much like I am far from the first person to enjoy a Toll House Cookie – but I must say – both are comforting classics that needn’t be messed with. Both are easily accessible and surprisingly perfect. So every now and then I like to get back to basics, mix up a batch of these delicious treats and enjoy them in the cool comfort of a stolen Hanes. Sunday night is almost always a baking night for me. I am usually bummed about the weekend being over and somehow the whole creative process and subsequent snacking process both work wonders, easing my transition to Monday. Tonight’s creation is feeding a group of hungry artists. Seriously. I decided to make something traditional but unconventional, classic but unexpected. What could fit the bill more appropriately than a reverse chocolate chunk cookie? There is nothing too extraordinary about this recipe but I firmly believe that oftentimes, the very best (not to mention yummiest) things are the most simple. These cookies boast big chunks of velvety white chocolate that burst through a rich dark chocolate base. They are a little puffy, a little chewy, and a lot delishy. In a large bowl, beat butter and sugars until the mixture is fully combined, light and fluffy. Mix in vanilla and instant coffee granules. In a separate bowl, stir to combine cocoa powder, flour, baking powder and baking soda. Slowly, adding in thirds, add dry ingredients to the creamed mixture, stirring until thoroughly combined. Fold in white chocolate chunks until evenly distributed. Drop tablespoon-sized scoops of dough onto lined cookie sheets and bake for 8-10 minutes. Allow to cool slightly before transferring to a wire rack. Finally, marvel at how incredible you are for turning ordinary ingredients into a delightful concoction, and celebrate that you did it all in the comfort of your jammies! Then, if you’re feeling so inclined, take a couple of them to munch on in bed and enjoy a sweet, sweet end to the weekend… …that is my plan anyhow!